cute stuff! <3 the old school lite brite feel. 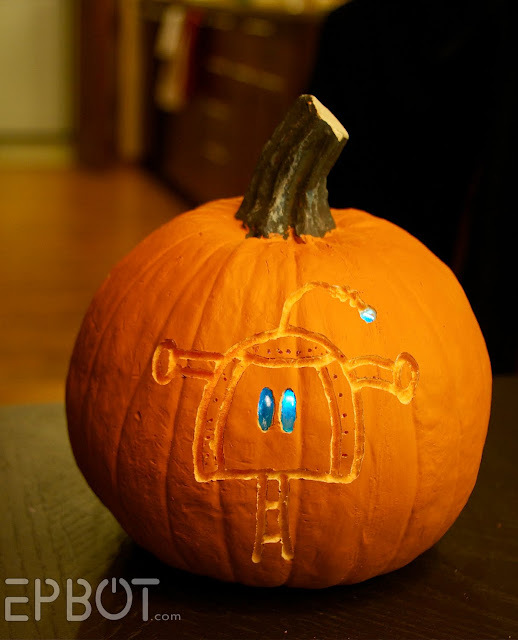 That is the cutest pumpkin EVER! How about a Star Wars theme for the next one? WOW!! I *love* it!! It's Beautiful!! I love them! The lit beads and gems are wonderfully creative. That is awesome!! I really haven't been in the Halloween mood this year, not sure why. But after seeing your design, I want to carve some pumpkins!! That looks AWESOME! Love how you used the glass beads sideways! I think the test pumpkin and the second pumpkin with the fireworks display both look great! 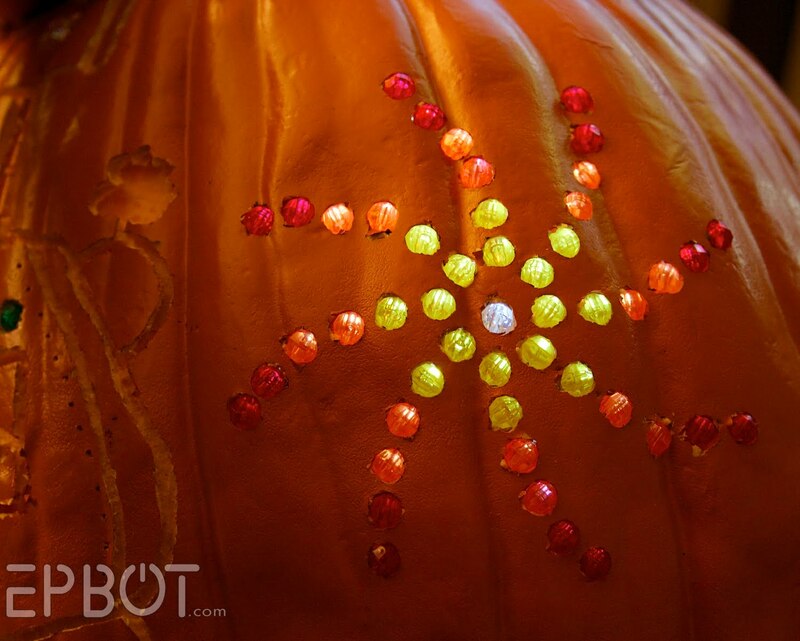 What a clever idea to do a litebrite-y pumpkin! Way cool. And you can use them year after year... bonus! 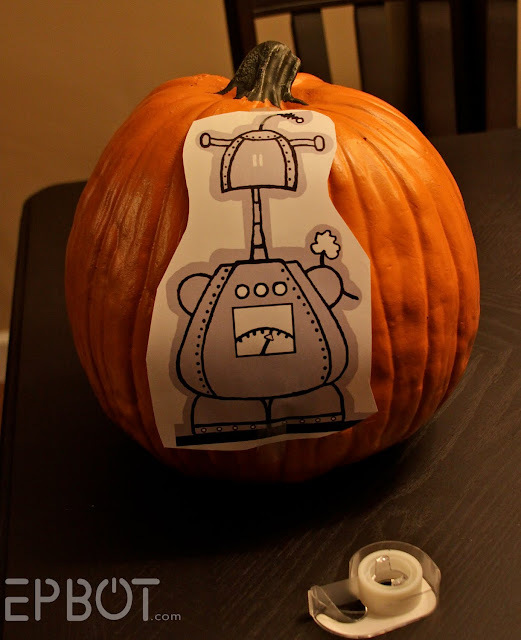 I love those complex templates, but since we do real pumpkins and I'm a clod, it probably won't go much beyond the simplistic cuts. So stinkin' cute. You come up with such clever ideas! 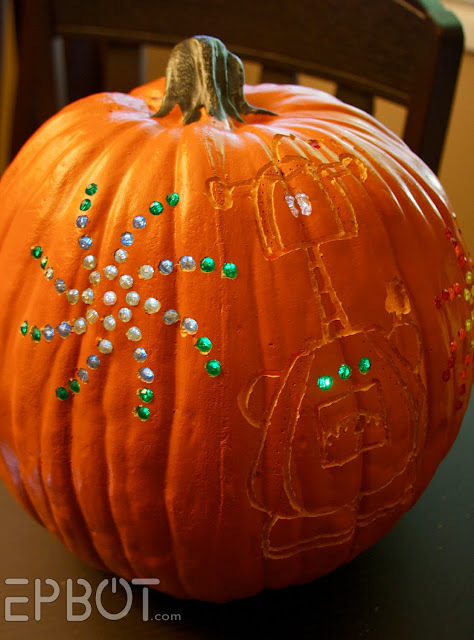 That is the coolest pumpkin ever! I have NEVER thought of using beads to make the light colourful! :-O !! wow, Jen and John, how very cool! Great work! Love the addition of beads to sparkle things up a bit!! you are just so darn creative! How incredibly AWESOME! :) Love it! 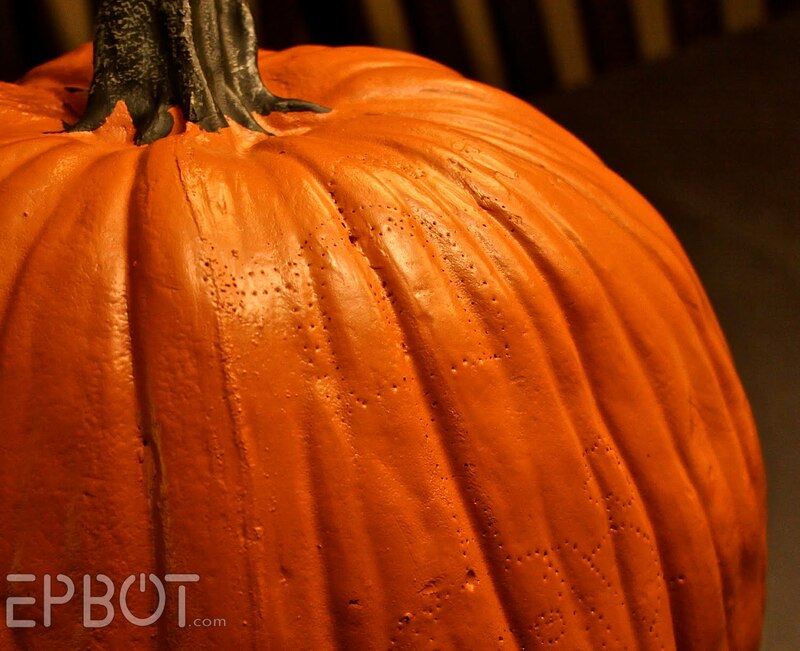 I carve a foam pumpkin while my kids do a real one every year, and yes the "sawdust" gets everywhere. also they sell kits with plastic golf tee things that are clear plastic it comes with a mallet and you can just pound them in your pattern. Just as a tip, you can print your design on tracing paper (I have to tape it to a sheet of regular paper in order to get it to feed through) and then glue it to the pumpkin using either a watered down glue mixture or some spray glue. If you use spray glue and let it sit for a minute or two before putting it on the pumpkin it's easier to take off later. 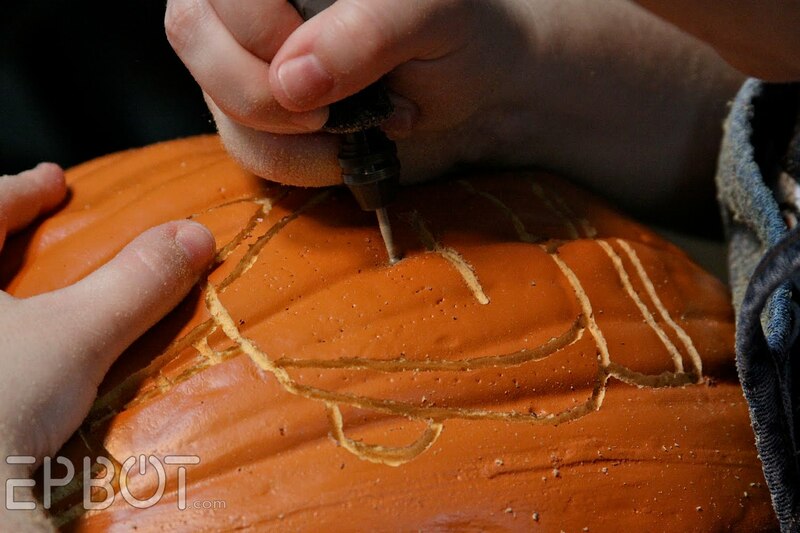 Then you can just use the dremel and carve right through the paper and not bother with all the pinpricks. 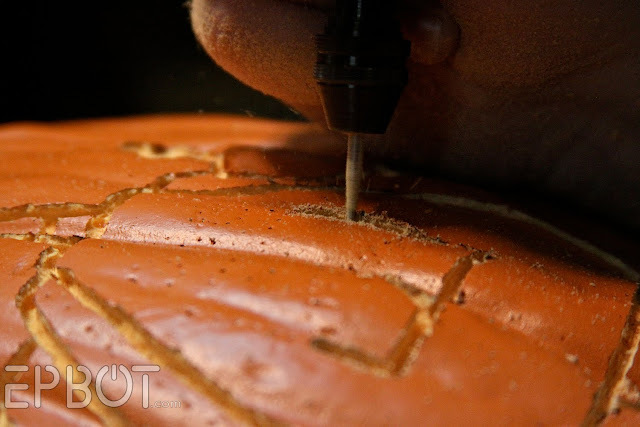 You also want to hold your dremel further up the body of it rather than close to the tip, or if you'd like to do more carving with it (either pumpkins or other things, I use mine on wooden boxes too) then you can look into a flex shaft and stand that will make it much more like using an engraving pen. I love Epbot and Cake Wrecks! You rock!!! 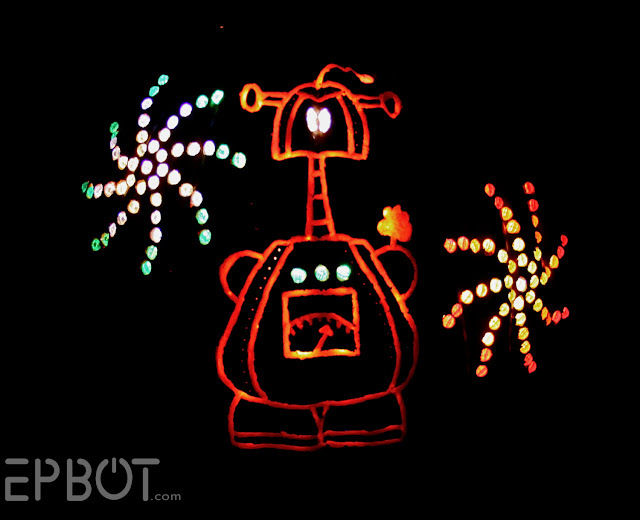 How about actually getting lite brite refill pack, with real light brite pegs and designs. I'll bet that would be pretty cool. Love the bot, he's absolutely precious! Truly awesome! 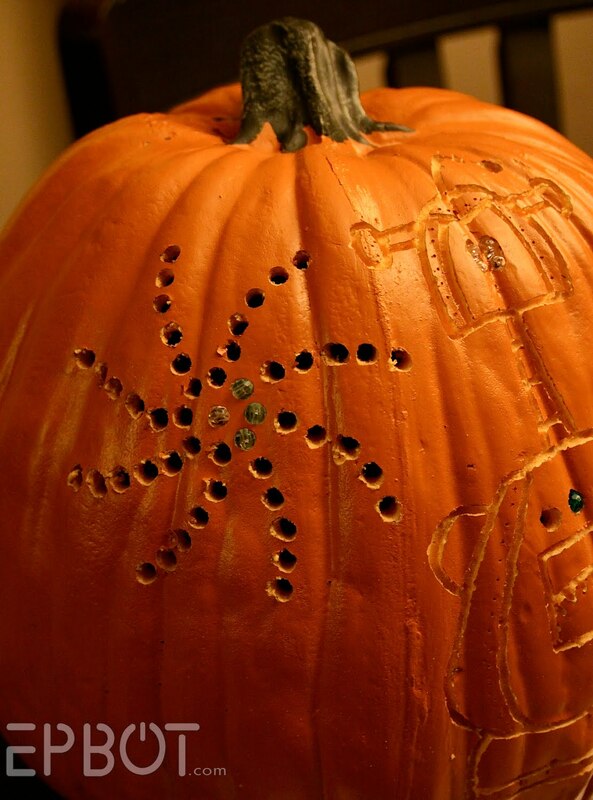 And yes, a pumpkin planetarium would be amazing - like those gadgets that display the constellations on ceilings and walls for home use!! 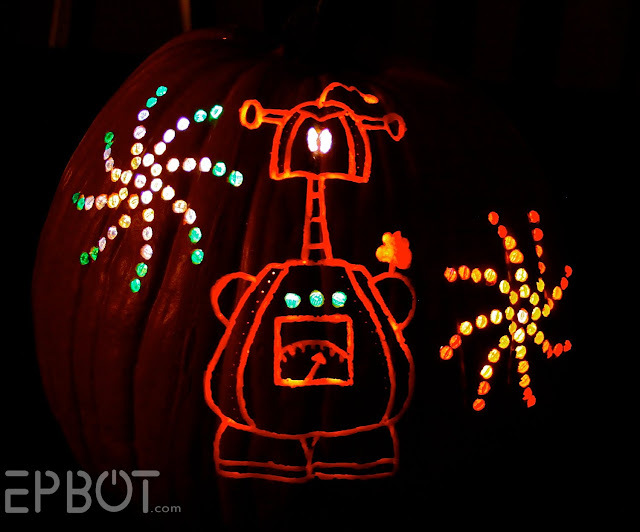 This isn't a pumpkin, but it is lite brite and it is REALLY Awesome. This post explains how they did it, and at the bottom is the video. And the song is pretty cool too. I think we may be hand twins. Great job, Jen! Thanks for sharing. 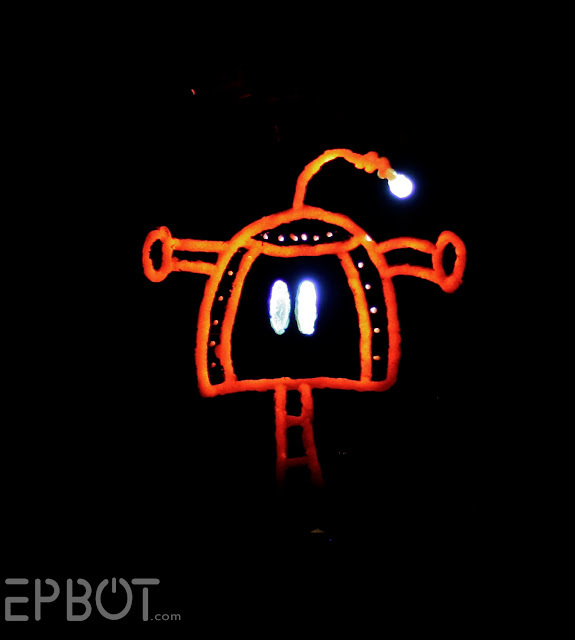 My O'Lantern last year was the winking smiley emoticon ;o) dot-drilled, and I used battery operated christmas lights stuck in the holes to illuminate it. Love the beads- so creative :) Might have to try it myself! Although here in Ye Olde Englande I don't think we have any foam pumpkins to play with..
A nice job, cool... I like it but don't let the deer or moose eat it until all the beads are removed. Whoa! That's super cute! I too have been wanting to create a 'lite brite' pumpkin this year as well. Never considered using beads till now. Ever tried real lite brite pegs? Just wondering if they'd work. Ha! The Claw! I thought I was the only one! I thought you had used Lite Brite pegs when I saw the pic. Great work! Awesome! My funkins are not nearly as geeky or as thick, apparently. I think the walls of mine are about 1/4" thick. I had to be super careful when cutting through (with the exacto attachment for my soldering iron). I was wondering how to do the whole shading/not cutting through idea, and you've answered my question! Love the beads idea. I'll have to save that for next year. 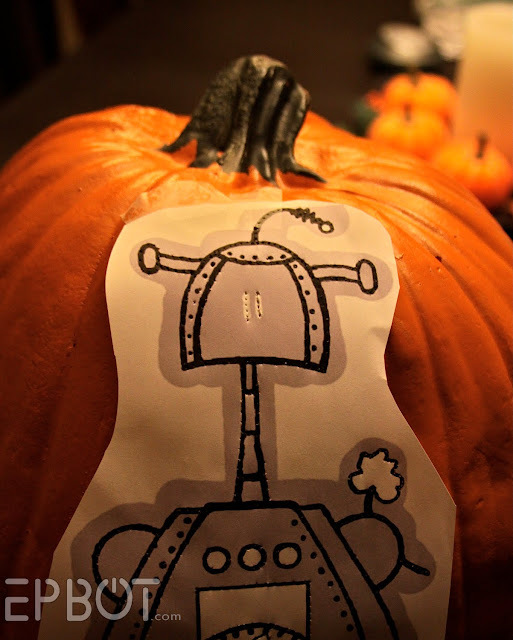 What kind of light did you use inside the pumpkin? I did a design on mine that go all the way through and can't seem to get enough light inside of it to get it to glow. (I put a candle in it but it went out because there wasn't enough air without holes in the pumpkin.) Thanks! I am definitely dazzled! VERY clever! Can't wait to see your next pumpkin project. 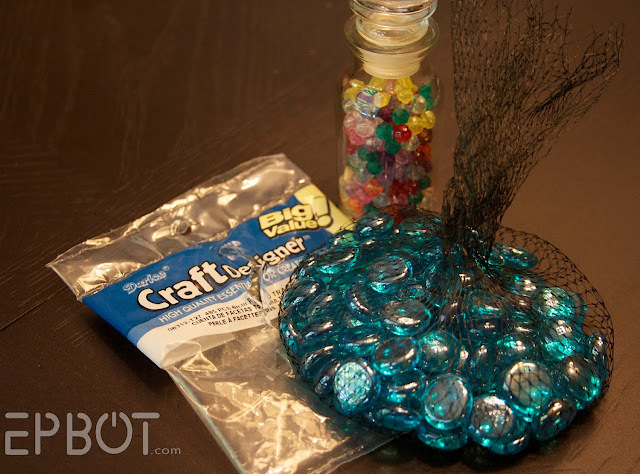 I have about a billion of those plastic beads--now I know how to put them to good use! Thanks! P.S. It's "planeh-arium" per South Park, BTW. @ Cyndi - John found a directional LED puck light for the inside. It's meant for under-the-cabinet lighting, and it's battery powered. It's extremely bright, but even so I had to aim it right at the design to get that much brilliance. Definitely don't bother with a candle, though; it's a hazard *and* too dim to do much good. Wow!! I LOVE this! It made me feel both incredibly happy AND insanely stupid. I had the bright idea to carve a Day of the Dead mask into a pumpkin - except instead of only doing a survace carving (which makes soooo much more sense) I just sawed right in and bascially the entire thing collasped. I do still have one pumpkin left so maybe I'll attempt to redeem myself and my carving abilities and try it again. This post has encouraged me to solider on!! That looks so so awesome and cute. 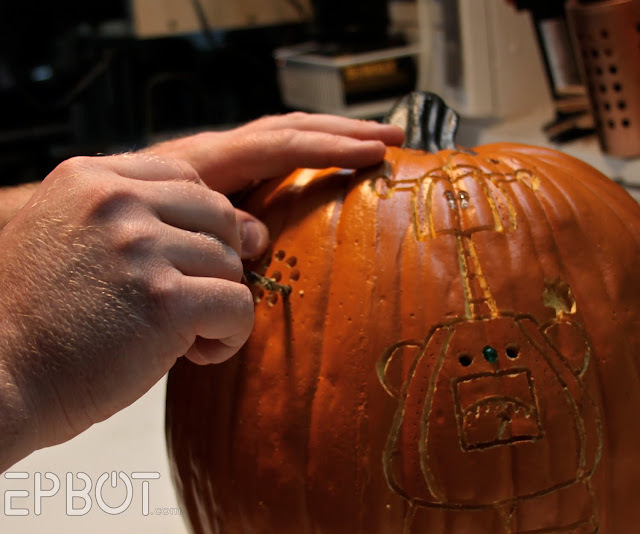 I love your little bot pumpkin! "The claw! The claw is our master. The claw decides who will go and who will stay!" That is awesome. I'm totally inspired now. I need to fit in a trip to Joann's this week. Great work! Seriously...I wish I was crafty. <3 you! 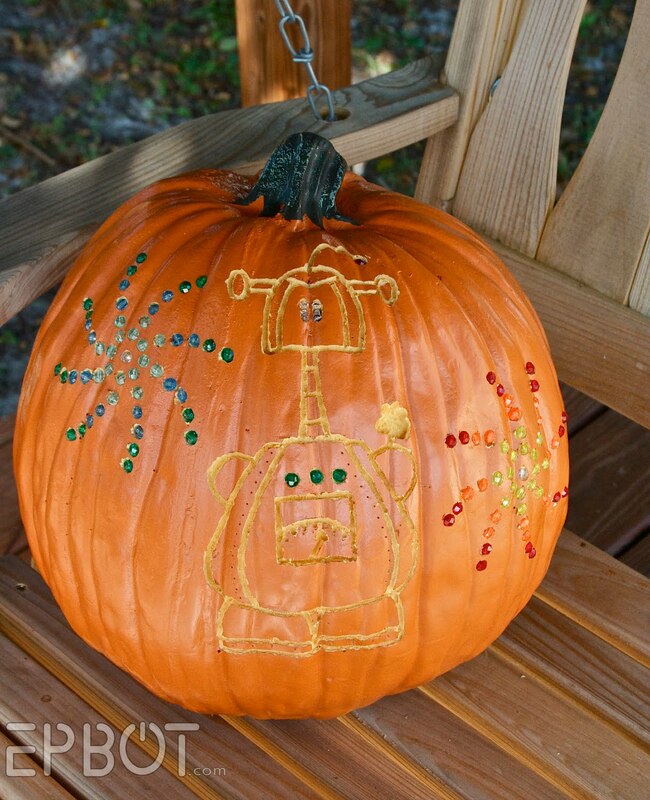 That is incredible and a nice twist on an already fun craft. ooh, awesome, I'm gonna use that technique for my TARDIS o'lantern! I bet light bright pegs would work to do that too. I have a couple of billion laying around the house that I step on regularly. Just a quick tip for folks! 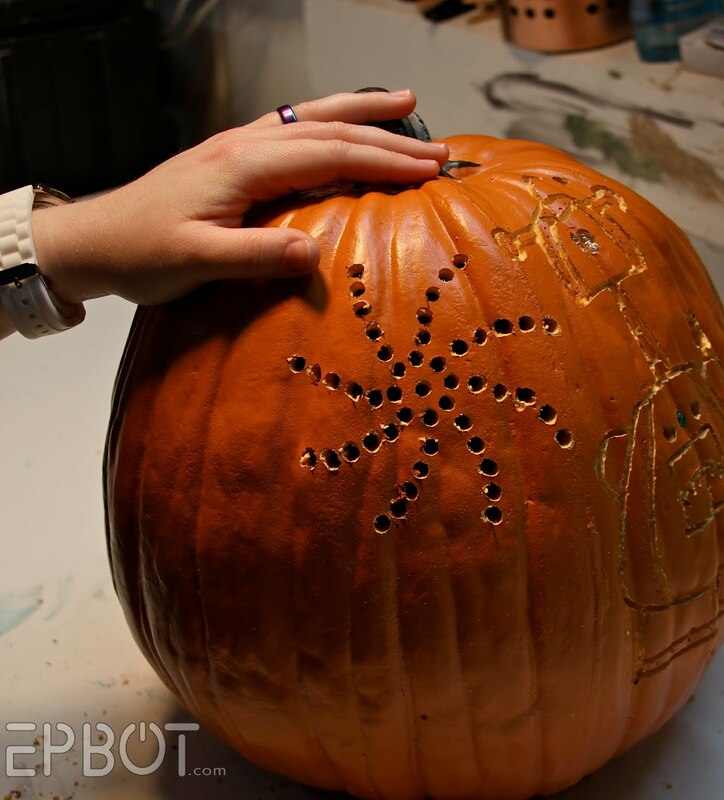 When poking the pattern holes into your pumpkin, I use a meat thermometer. It is a lot easier to hold onto than the ones that come in the carving kits, and the end doesn't get dull. Thanks for the inspiration Jen! 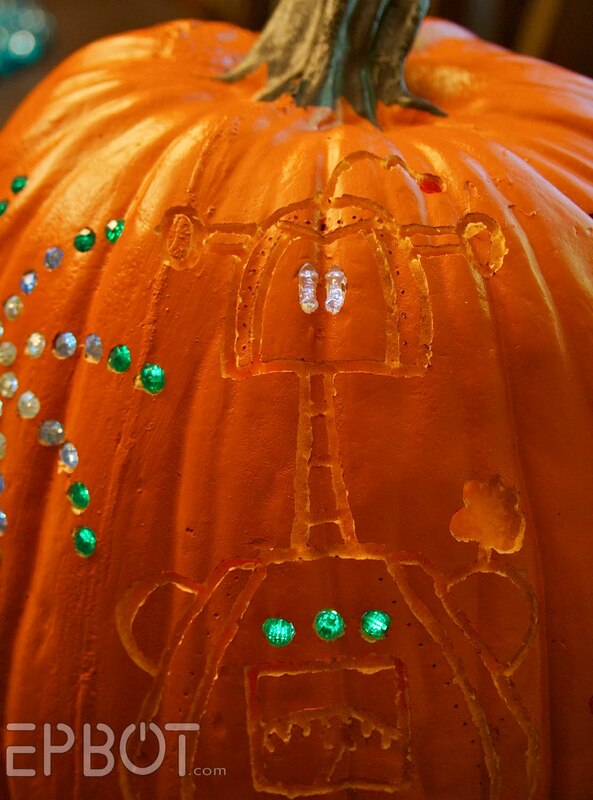 I used your lite-brite idea to embellish my entry for my office carving contest. I found these fantastic blinky stars to add a bit more bling and possibly a few seizures. It reminds me of a litebrite! !